Back in May, we made quick mention that we started putting more people in front of the lens but haven’t really done anything to show you the results. Let’s change that, shall we? But first let’s preface this by saying we do not consider the following to be what you should expect as professional level portrait photography, not by any means. Our friends give us a lot of credit and while we appreciate the faith they put in us to take their photos, we are far from having the skill level of photographers who do this for a living. We do this because it’s a new area of photography for us to explore while giving us an excuse to hang out with friends at the same time. Win/win. We first start with a trip we took to Monroe, WA over the weekend to visit Hans and Karli for a quick photo shoot with their son, Andrew. This family has been a big part of our lives for several years now so when asked to take pictures of them for the upcoming Holidays, we were of course happy to accommodate. This was our 3rd visit since our first “shoot” with Drew shortly after he was born a little over 7-months ago. It’s been incredible watching him grow in just a short amount of time. Check out the difference from our last two visits, only months apart! Hans and Karli are expecting their second child within the next year! It’s going to be fun watching this family continue to grow. Next up are Crosby and Debbie, good friends of ours whose pictures we took last March in celebration of their wedding engagement – The two tie the knot next May! After meeting with them for lunch at Tat’s Deli in downtown Seattle for some of the best sandwiches the city has to offer, we took to the streets to see what photos we could capture. The sun was out but it was cold and windy which at times made it difficult to get that right shot. Ducking around corners and utilizing the best of our surroundings, we managed to round up a decent set of pictures. 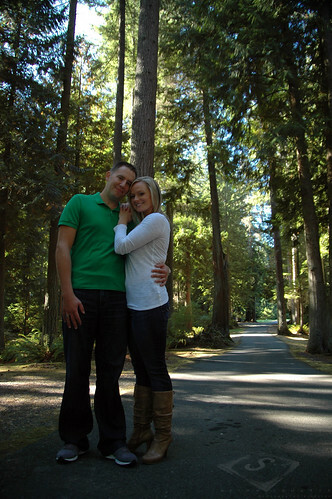 They even selected one of the photos for their Save The Date card! Crosby, Debbie – we wish you both the very best and look forward to joining you on your big day! A year ago, we met up with Rob & Liliane to celebrate their engagement. They were well aware we had little experience in this area but had faith in our ability to give them what they were looking for and requested we give it a shot. 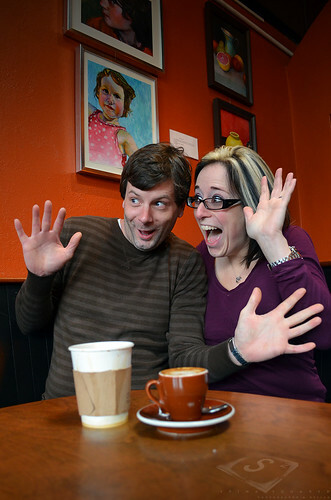 It was another cold day so we started with a warm cup of coffee in Ballard before heading down to Golden Gardens. This is where the first sparks flew for the two and they’ve been madly in love since! The bone-chilling wind was only bearable for so long before we decided to find the next location to shoot. We took off towards Seattle and stopped by the Olympic Sculpture Park and then rolled over to the Seattle Library for another change in scenery. It was a fun afternoon in Seattle! 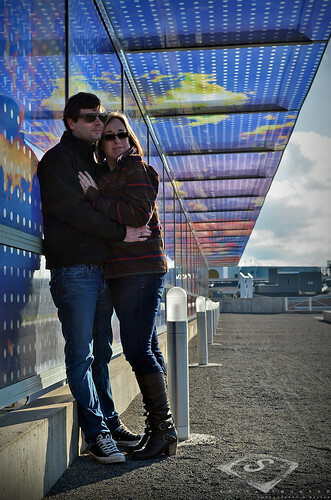 Lindsay and Rhett were the first to ever ask us about an engagement photo shoot. We made it clear we had no experience whatsoever and were at first apprehensive to say “yes”. What if they didn’t like the results? Where do we even start? Fortunately for us, Lindsay already had a good idea of where she wanted us to take them. First up was the David E. Brink Park on the Kirkland waterfront, overlooking Lake Washington. It made sense, considering the two spend most of their Summer wake boarding there. Then they took us to Radar Lake, the venue of their wedding and private retreat for pro wake boarders. 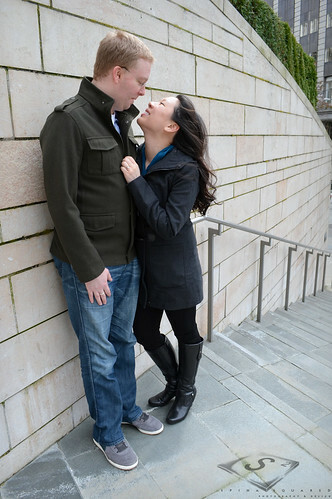 You may recall a post in October, ’12 hinting that we were attempting our first engagement photo shoot. What a beautiful piece of property with a gorgeous view! And there you have it, our first attempts at putting people in front of the lens. Looking back, we’d say we did “ok” but there is much room for improvement. We thank our friends for giving us the opportunities to test our abilities, particularly for such special occasions!